Employees of Lucasfilm, Industrial Light & Magic, and Skywalker Sound came together at our San Francisco campus for a special screening and discussion to celebrate the 30th anniversary of our fantasy epic, Willow. ILM veterans Dennis Muren, Jean Bolte, and Doug Smythe – all still active employees at the company – shared memories and insights into the visual effects wizardry of the classic film. At its time, Willow was on the cutting edge of new innovations, combining the best of practical techniques with the latest digital tools. Among Willow’s groundbreaking moments was the morphing sequence – where the would-be sorcerer Willow Ufgood magically transfigured a goat through a series of animal forms and finally into the human sorceress Fin Raziel. Jean Bolte began her ILM career as a Model Maker on Willow after a number of years working in the British film industry. “There was so much going on,” she remembered about her arrival at ILM, “but also the respect was phenomenal. Everybody was valued, and there was a feeling that you would stick around, which was unusual.” Bolte helped to craft the intricate puppets filmed in the morphing sequence. 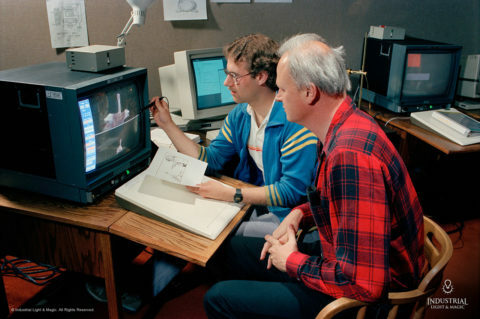 Another ILM veteran to begin their career on Willow was Computer Graphics Programmer Doug Smythe. The then-recent college-graduate was hired for his expertise in the burgeoning field of digital imaging and computer-based film production tools. Smythe recalled that the Computer Graphics Department at the time numbered only six people. Smythe helped pioneer the new visual effects technology that brought the morphing sequence to the silver screen. “You couldn’t buy anything off the shelf to do this,” he recalled. It was the era of “write-it-yourself” in the world of software.